Spice Up Your Deck or Patio! - Beautify your outdoor living space by hanging bird feeders, suet baskets, planters, flower pots, lanterns, holiday decorations, string lights, wind chimes, ornaments, and more! - Adjustable base clamp accommodates railings up to 2 inches thick. - Dual hand swivels allow you to effortless adjust the height and angle of the hook. No tools necessary! - Allows you to position your feeder or planter away from your deck to avoid a cluttered feel and enjoy more space. - Seeds and bird droppings fall away from the deck preventing you from having to constantly cleanup messes. 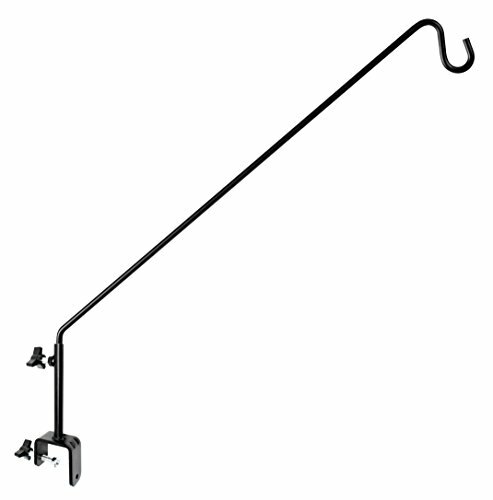 - Easily refill feeders by simply loosening the swivel and turning the hook back towards your deck. - 37 inch long pole makes it difficult for squirrels to reach the bird seeds. - Premium quality steel that is rust resistant and durable provides for a long lasting product. - Curved tip helps securely hold items. If you'd like your money back at any time within 6 months of purchase, no worries. Just ask. Adorn your outdoor living space now! SMART DESIGN: Allows you to position your feeder or planter away from your deck to avoid a cluttered feel and enjoy more space. Seeds and bird droppings fall away from the deck preventing you from having to constantly cleanup messes. Easily refill feeders by simply loosening the swivel and turning the hook back towards your deck. 37 inch long pole makes it difficult for squirrels to reach the bird seeds. EASY INSTALL: Adjustable base clamp accommodates mounting on railings up to 2 inches thick. Dual hand swivels allow you to effortless adjust the height and angle of the hook. No tools necessary! Great hardware to mount outside, on your porch, exterior balcony, or patio deck. MULTI-PURPOSE: Beautify your outdoor living space by hanging bird feeders, suet baskets, planters, flower pots, lanterns, holiday decorations, string lights, wind chimes, ornaments, wind spinners, coconut baskets and more! PREMIUM QUALITY: Rust resistant, heavy duty steel construction. Weather proof black powder coated cast iron. Bring your heaviest feeders and planters! A dark finish stunningly complements anything that hangs from it, adding elegance and beauty to your outdoor living space. Solid bracket and curved rod tip helps securely hold items. GUARANTEE: GrayBunny offers premium products for your lawn and garden while exceeding highest industry standards and offering impeccable customer care. If you'd like your money back at any time within 6 months of purchase, just ask. Click the "Add to cart" button on the above right to adorn your outdoor living space now! GrayBunny GB-6837 Fancy Curved Hook, Set of 2, White, Cast Iron Wall Hooks For Bird Feeders, Planters, Lanterns, Wind Chimes, As Wall Brackets and More!